A significant portion of this article deals with development / pre-release / Beta content. A request has been made for it to be updated. Cinematics or cut-scenes are movies seen in the game, or released as promotional tools, that tell the game story, introduce new characters, or just generally serve as promotion or advertising. Blizzard has a long history of producing high quality movies through their in-house Cinematics Team, and these have been included with every game they've released since WarCraft II. Candles are lit in the intro cinematic. During the development of Diablo III, Blizzard released three full CGI cinematics, and three class introduction cinematics which were produced machinima-style using the game engine. Cinematic: WWI 2008 was the first, released with Diablo 3's premiere at the Paris WWI event, June 2008. This cinematic introduces the game world, hints at the plot, and shows some great scenery. The Black Soulstone cinematic debuted at Blizzcon 2011 and offered the first preview of one of the full game cinematics. This movie will show after Act 2, setting up plot events in Act Three. Note that this is a slightly-edited version of the movie, with a few things removed to preserve plot spoilers. Diablo III Introduction cinematic debuted in December 2011. This is the full game opening cinematic which players will view before the action begins in Act One. It introduces Leah and Deckard Cain, shares extensive background history of Sanctuary, and leads into the opening action of the game, with the mystery of the falling star that crashes into the Tristram Cathedral. These were produced in the game engine, machinima-style, and debuted with each of the final three classes, at Blizzcon in 2008, 2009, and 2010. Cinematic: Wizard was released at Blizzcon 2008. This machinima style movie introduced the Wizard character, and showed her marching boldly through the Tristram Cathedral, past scornful villagers, en route to a final battle with Leoric, the Skeleton King. Cinematic: Monk was released at Blizzcon 2009. This machinima style movie introduced the Monk character and showed him battling Cultists in Arcarnus, before a final battle against a disguised Morlu Caster. Cinematic: Demon Hunter was released at Blizzcon 2010. This one introduced the Demon Hunter, and made clear the growing expertise of the Blizzard cinematics guys with the machinima style of in-game movie making. (Though many fans found the dialogue painfully corny.) In the film the Demon Hunter finds signs of a massacre, tracks the one human survivor and defends her from another attack of demons, before recruiting her as a new Demon Hunter. Though many fans requested them, Blizzard declined to retroactively create machinima-style introductory cinematics for the Barbarian and Witch Doctor as they thought it would be too much effort for little purpose. Players will view short cinematic intro movies for all five classes, in the final game. 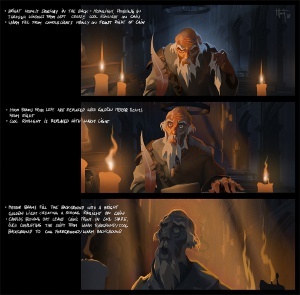 These are created with voiceovers from the characters themselves, and feature 2D style animation similar to that of the "Deckard Cain's Journal comes to life" as seen in the full game intro cinematic. Cinematic storyboard mapping out the final movie. Diii.net: Can you comment on the cinematics? The overall length and presentation? When will players see them during the game, and how long will they run for? Kevin: That’s not really been decided, since they’re still a work in progress. Currently the plan is to show some at the beginning and end of each Act, but the exact structure isn’t yet finished. Diii.net: Any idea how long they’ll be in total? Comparable to D2? Kevin: We really don’t know yet, since all of the scripts aren’t finished. We're using cinematics to about the same level as Diablo II did. It's a difficult story to tell with cinematics because we basically have a main character who can't be in the cinematics. We've really focused on the ancillary characters - Their focus is always to be kind of implying the player's presence right outside the room on the other side of that door. We don't have a big focus on in-game cinematics. We try to tell our story through action, through questing, and through events. We do have a lot more scripted events, but we separate those from in-game cinematics in the fact that we don't pull control away from the player. Since that time, the preview of The Black Soulstone cinematic and the Diablo III Introduction cinematic have shown two of the five full cinematics, to the satisfaction of most fans. The team debated implementing realtime-cutscenes using the game engine (as is done in Starcraft 2) but scrapped the idea since it would have been too much work. There are too many characters, too many NPCs, and with five classes, times two for each gender, plus 18 different armor sets/appearances. Beginning with World of Warcraft and continuing into Starcraft 2 and Diablo III, Blizzard has produced two types of cinematics. The traditional, fully CG cinematics are animated short movies about the games. These are produced by the Blizzard cinematics team in much the way a movie company like Pixar creates their feature films, and while these movies originate from the same concept art and designs as the rest of the game, almost all of the artwork and environments are created from scratch for the films. The newer type of "cinematic" that's been used extensively to promote World of Warcraft and now Diablo 3, is created with the game engine itself. This technique is known as Machinima, and players can make this type of movie themselves, simply by recording what their character sees as they play. The better fan-made movies are created with the assistance of third party tools, and include soundtracks, dialogue, and sometimes even original special effects and animations. One fine WoW example can be seen here. Red vs. Blue, A fan-made series using the Halo game engine, has become a huge internet success, with episodes even being sold on DVD with the consent of game publisher Microsoft. Joystiq.com: Monk introduction cinematic was choppy in a few places, it looked a little rough. You know, usually Blizzard's cinematics are so gorgeous and everything looks like it's out of a CGI movie. Was that put together in-game? How did you guys create that? Leonard Boyarsky: Yeah, that's an in-game done by our AV team. We have two different ways of doing them. A lot of times when they announce patches for World of Warcraft, you'll notice that they'll do in-game ones as opposed to full-on cinematic ones. That's what that one was. Same with our Wizard one last time. They were developing that as we were developing a lot of his skills. I think they did a really good job with the limited tools that we allowed them to have at the time. [laughs] But I thought it was really cool, myself. But I know what you're saying. Yeah, there were a few times where you were like, "Oh, it's a little choppy" or some of the characters in the background looked all the same, you know. They're facing the same way, moving the same way. Kevin Martens: They didn't get the assets very early; they didn't have more time. Leonard: We'll take full responsibility for that. [laughs]. The mysterious meteor hurtles towards the Tristram Cathedral in a scene from the Diablo 3 introductory cinematic. There are two cinematics in Diablo II: Lord of Destruction. The intro cinematic as well as the final ending cinematic, with the destruction of the Worldstone by the hand of Tyrael. This first epic scene shows Baal in his true form (but seems to have taken the skin off of Tal Rasha's corpse and stretched it over his head), and with reinvigorated powers from Hell, and refreshed demons ready to tear a path all the way to Mount arreat. This scene takes place outsides the gates of Secheron, the Barbarian capital, where an old, but brave Barbarian guard tells him to leave. Baal pretends to think for a second, and uses a Mana Rift spell to literally make the guard explode. With this answer, the demonic horde storms the Barbarian city. The last cinematic in Diablo II: Lord of Destruction. Having defeated Baal, the last of the three Prime Evils, Tyrael informs the players the Worldstone has been corrupted by the demon, and is forced to destroy it. What effect this will have on Sanctuary, no-one knows. This cinematic is the introductory scene to Diablo 2. It was produced in-house by the Blizzard Film Department and released in March 2000. It runs for 7:10. The last of the Diablo II cinematics. Marius is telling of how Diablo was killed, and the Soulstones destroyed. However, Baal fools Marius into giving him his Soulstone, and the story line for Diablo II: Lord of Destruction begins. These are some of the original Diablo II trailers and commercials. Some of these have been largely forgotten. The first Diablo II: Lord of Destruction trailer shown. It's a compilation of what would later be the intro cinematic to the expansion, but also mixed in with plenty of detailed pictures of the Worldstone, some of which are exclusive to this particular trailer. Compilation of Diablo II cinematics in a TV spot. The classic 2000 Christmas commercial for Diablo II. A must-see. The 1999 E3 cinematic is much closer to the actual game. This is basically a collage of little cuts from the in-game cinematics, rearranged for dramatic effect. The voiceover does actually talk of basically everything that will happen in the game (and expansion), which is kind of interesting. This cinematic trailer was the first produced for Diablo II. The events presented in it are non-canonical; it was just a promotional video produced before the plot for Diablo II had been hammered out. The first announcement trailer for Diablo II. Possibly being pictures of Tristram Cathedral as it's being attacked by demons after the Dark Wanderer left the scene. It could also be just some random church on fire, as this was so early in development, it's likely the entire story line was not ironed out by then. It's interesting to note that much of this 3D rendered material did not make it into any of the games. As Diablo I came out in a time before video games were widely advertised, there's no Diablo I commercials, but there are deleted scenes that were made, but never added to the game! This is the intro cinematic for Diablo: Hellfire, the official, but unsuported expansion of Diablo I made by Sierra Entertainment. Welcome to the world of Diablo. this is the first ever Diablo cinematic, introducing people to the dark world of Sanctuary, as Tristram has been invaded by a demonic force. The first cutscene of the game is showing the Archbishop Lazarus at the Tristram Cathedral's altar, at a point where he's clearly corrupted by Diablo. After this cutscene was shown, it leads to the player's confrontation with Lazarus and his succubus guards. We don't know why exactly some snippets were removed, possibly to save some programming, but there used to be one ending per class, but in the final game, it's only the Warrior you can see. The last cinematic of Diablo I. We see the Dark Wanderer standing We don't know why exactly some snippets were removed, possibly to save some programming, but there used to be one ending per class, but in the final game, it's only the Warrior you can see. As mentioned above, Diablo I came with deleted scenes. It's not clear why some of them were removed, but they still exists in the game files, and as such are shown here. They have never officially been released. This Butcher introduction was removed before the game went live, and it's the scene fans are most surprised was deleted. It's a tad gruesome, yes, but there's corpses and death all over the game, so it seems unlikely to be because of censorship. The Map of the Stars cut-scene was specifically removed since the quest itself was considered ruining the player-driven nature of the game. You can see the original Diablo render here doing something with these stars. The first of two additional ending scenes that exist for Diablo I, but was not officially part of the game. The second of two additional ending scenes that exist for Diablo I, but was not officially part of the game. This page was last edited on 1 December 2013, at 19:56.